Just a few weeks ago, we wrapped up our second collegiate-dedicated event, NGS@LA, which took place at the beautiful Los Angeles Athletic Club in Downtown Los Angeles. Attendees from the greater LA area and schools including the University of Southern California, Claremont McKenna College, Loyola Marymount University, Chapman University, Occidental College, and more joined together to network with other young entrepreneurs and learn from empowering speakers, partners, and mentors. This event truly embodied the spirit and heart of what it means to be a young entrepreneur. We gathered, bright-eyed and bushy tailed, early on Saturday morning, ready to learn and be inspired by each other. As our team assembled the venue, the anticipation grew and grew. The Red Bull ‘Wings’ Team set up shop, armed with enough Red Bulls to last a year, and the demo space for Red Bull Launch Institute winner Steven Dourmashkin came to life. Steven is the Founder of Specdrums, an app that transforms colors to sounds by allowing the user to tap on a variety of shades and assign a unique sound to each (red for a snare drum, yellow for a guitar, and so on). This colorful, playful experience exhibited the sheer creativity and genius of the hundreds of entrepreneurs that would join us at NGS@LA. Our Director of Community, Haley Hoffman Smith, led a conversation with Steven on the main stage to learn more about his entrepreneurial journey. Steven was the first winner of the Red Bull Launch Institute, an accelerator by Red Bull that provides resources and mentorship to entrepreneurs. Red Bull sponsored Steven’s trip to the Techcrunch Disrupt Conference in San Francisco, which was a transformative experience for his app thanks to the connections he forged and the feedback he received. Siëo, our NGS@LA partner, is a business development company which helps entrepreneurs transform their ideas to real ventures, providing the resources to do so. Team member Kyle Herron led the participants in a problem solving group activity, to address one of LA’s biggest and most pressing issues: homelessness. 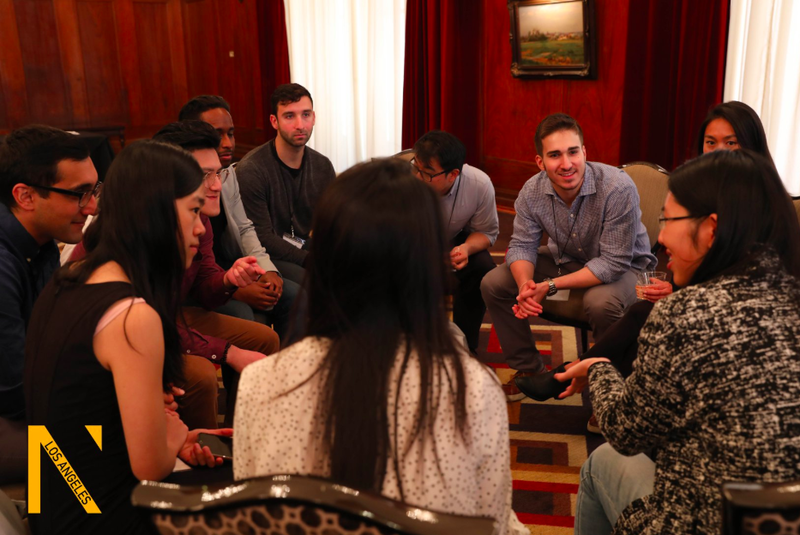 Given a quick background on the extent of the problem, groups of strangers became friends as they were placed into groups to discuss viable options and innovative solutions. They then pitched these ideas to siëo and Next Gen member Max Le Merle, who is the City Council board focused on tackling homelessness in Los Angeles. To our attendees, this experience made their ideas all the more tangible; breathing life to the genius of their collaboration, helping them recognize that innovative solutions are real and possible. The afternoon brought more personal discussions — we heard the epiphanies and hard-earned lessons of speakers like Felix Hartmann, General Partner of Hartmann Capital, Jonathan Maxim, Founder of Vea Fitness, Olympic boxer Cristina Cruz, and Blockchain developer Taylor Johnson. Questions such as “What would you tell your 18 year old self?” yielded personal reflections about the journey of entrepreneurship; as much as we predicate our “success” in the business world on the success of our companies, the speakers urged the audience to think about such thoughts differently. We learn something with everything we create, and all that we do — regardless of how individual projects end — allows us greater acuity in the next venture we undertake. So what if it’s all just play and curiosity? What if we ditch the fervent attempts to create something that makes money, and instead make something for the sake of our personal creativity and discovery? The amalgam of experiences on the stage drove home this approach, leaving everyone in the room inspired, invigorated, and ready. Throughout the day, we were joined by industry-leading mentors who met 1:1 with attendees to advise them on everything from their startups to legalities to life, in general. Mentors included Founder of Brave Millennial Laura Youngkin, biz expert Brandon Wynn, Attorney Steve Meyers, Lauren Pfeifer and Robert Maifor fundraising, Baily Hancock for career strategy, Austin Stofer for team culture, and Rishi Thomas for student’s entrepreneurship. In the background of all the day’s activities, venture capitalists and investors gathered to field pitches from five teams, all of whom had been selected after applying to pitch before the event. In addition to individual angel investors, NGS@LA welcomed partners from Scopus Ventures, Contrary Capital, Crosscut VC, Mucker Capital, Silicon Valley Bank, OneH, Maschmeyer Group Ventures and more. After pitches, the investors and founders engaged in a 20-minute Q&A to help teams identify their #1 value propositions and how to harness their business models moving forward. The investors then deliberated on the many fantastic pitches of the day, selecting the top three to pitch live in front of NGS@LA’s audience: Shopify, SaRA, and Apeiron. Once the finalists were announced, the entrepreneurs enjoyed the chance to share their stories with the room. Then, the audience had the chance to play VC, themselves, voting on their favorite. While the results were calculated, Associate Producer of Shark Tank Ali Fazel joined Haley onstage for a live Q&A with the audience, diving into the show and further igniting the room’s enthusiasm for venture investing. With 50% audience vote and 50% judges vote, the team at Apeiron was the day’s winner! Apeiron, led by Aria Samiei and Han Cai, licenses technology that extracts carbon from power plant fuel to make graphene, transitioning plants toward zero-emission while generating more profit. As the day came to a close and old/new friends said goodbye, our team felt elated with the energy of the day and all the magic that flowed through the space. We witnessed vulnerability, true connection and relationship building via networking, and the spark of inspiration that challenged those present to find what they truly love exploring and building. The attendees, speakers, and mentors embodied the resilience and vision shared by some of the greatest creators of our time. We can’t wait to provide only more opportunities like NGS@LA for innovators to come together and learn, grow, and share — and in the process change the world. Next Gen is the premier business hub providing the knowledge, mentorship, and resources entrepreneurs need to create and grow meaningful companies. Next Gen is the premier business hub providing the knowledge, mentorship, and resources entrepreneurs need to create and grow meaningful businesses.